After three nights in the town of Bodrum and the good fortune of finding the Bodrum Datça ferry running on the day we wanted to travel, we arrived in Datça town. The plan was to stay for one night, just to spend a bit of time in the actual town rather than around the peninsula. We extended that stay to two nights and could have stayed around for much longer! It had been 14 years since our last little visit to Datça town. We were staying at Aktur with friends and drove to the centre for the day. It being mid-November meant most of the beach bars and restaurants were closed but we recalled sitting by the water and all being pleasing to the eye. So when we read a more recent article describing Datça town as ‘workaday,’ we were a bit confused. Perhaps our memories were serving us badly. And that’s why we only planned the one night. Well, each to their own and all that. One person’s ‘workaday’ is another person’s idyll. If we hadn’t completely fallen for Datça town on that November day 14 years before, we certainly did this time. Datça town is pretty, chilled, compact, it’s coastal, it’s got beaches, the food’s great and the climate is cool and fresh. Here’s how to while away three days and two nights in Datça – and if you’re like us, you’ll be more than happy to stay around for longer than that! Kumluk Yolu (Sandy Way) isn’t sandy at all. It’s a pedestrianised cobbled way that lines the coast and the Datça beaches. Along the main stretch, as you can see, it is so pretty. It is lined with restaurants, many of which make their presence felt by filling the route with vibrantly coloured flowerpots. A stroll along here is so pleasant, especially early morning. We were in Datça town off the back of the Bodrum Global Run and had to do some post race ‘cool down’ jogs. Certainly no complaints from us, trundling along here just before breakfast on a sunny spring day. There are lots of places to feed and water yourself in Datça town, but, don’t forget, we were only around for a couple of nights. 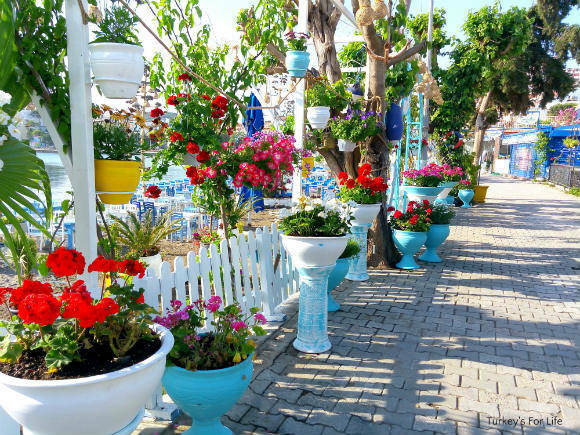 Along the Kumluk Yolu, all those floral displays outside the Datça restaurants lead the customer down steps and onto the Blue Flag beach. Here, you can sit and dine on the beach right by the sea. And here’s just a sample of the foods we managed to munch our way through. 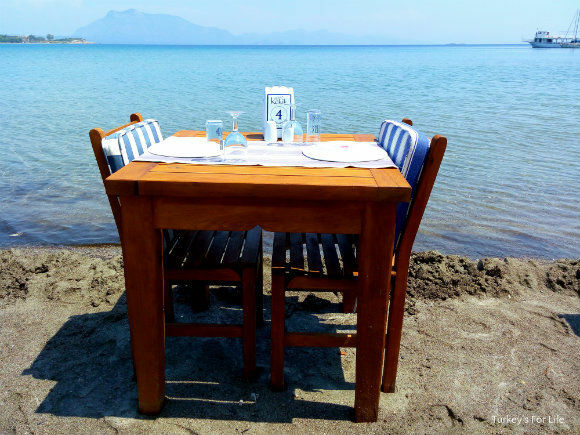 The Datça restaurants along the beach are a similar set up to many of the restaurants around Fethiye such as Girida Balık. 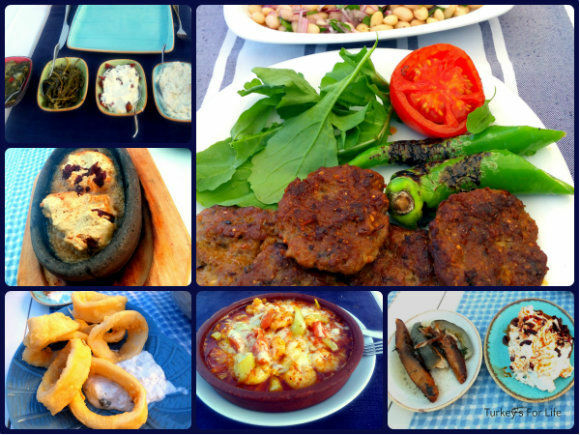 They’re about meze and fresh seafood dishes. No menu. You look in the fridges and feast your eyes and tempt your tastebuds. Exquisite deep fried calamari, karides güveç (prawn casserole), çiroz (a cured fish from the mackerel family), sizzling hot hummus served in a clay pot topped with chillies and bubbling melted butter. And then, of course, there are the yoghurt meze dishes and rock samphire. Lunch on that first day was homemade köfte and piyaz served by Kekik Restaurant. They’re famous for their köfte; the family were sat inside the old Datça house that is now the restaurant. They were cross-legged around a huge slab of minced meat, chatting and rolling köfte balls in their hands. You can opt for plain or spicy. Of course, we went spicy. 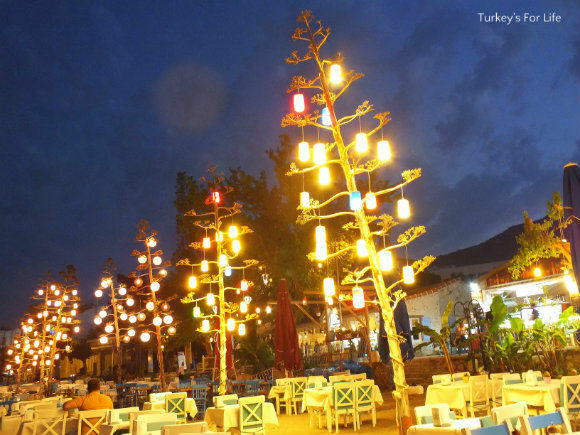 At night, when the sun goes down, the beach and Datça restaurants along this stretch of beach become illuminated by ornate lighting systems. All is still low key and relaxed. As the sea lapped against the shore, we grazed our way through seafood meze and I loved the local Datça wine. One of the wines from the Datça Vineyard has recently won a gold medal from the Concours Mondial De Bruxelles. I was drinking the very reasonably priced house rosé and, not knowing Datça’s wine fame before we arrived, wasn’t expecting too much from the first sip. A perfect added bonus to be able to enjoy this local wine with our meals. A few minutes’ walk around the pathway of Kumluk Yolu (or a hop across the town square) brings you around to the other side of the bay and Datça harbour. Datça harbour is a pretty, traditional set up with fishing boats – a scene not unlike the older part of Yalıkavak on the Bodrum Peninsula. This part of the harbour is home to the fishermen’s cooperative from where they sell their catch of the day. A few of the day trip boats also leave from this part of Datça harbour. Half and full day tours around the stunning bays of the peninsula. Not everywhere was fully open at the time we were there. Some still gearing up for summer. But it’s a different atmosphere around Datça harbour compared to the beach restaurants just around the corner. This is a place of bars and coffee shops and smaller restaurants. We enjoyed drinks around here whilst watching gülets and privately owned yachts enter and leave the bay. 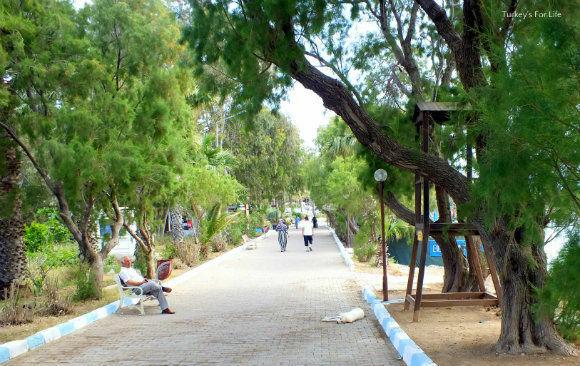 Stroll further along this stretch and you will eventually come to Ilıca Gölü (Ilıca Lake). Again, we hadn’t done much research before we came to Datça town so trundling around Datça harbour on a morning jog and suddenly coming face to face with Ilica Lake, well this was where I stopped off for a few minutes to enjoy the scene and take a few photos. 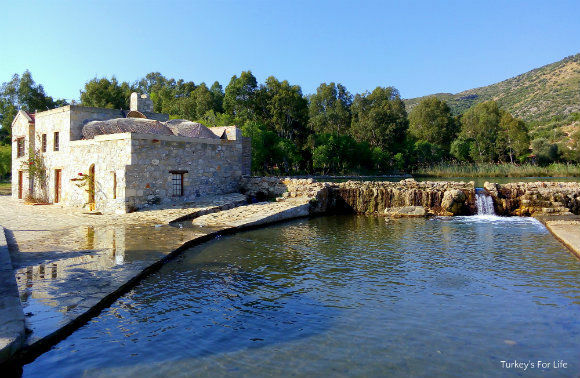 Fed by springs, Ilıca Lake is filled with fish and, apparently, ducks are to be seen paddling here, too. No such luck for us on our visit. All was quiet apart from the sound of the tumbling water as it fell towards the sea. The old stone building to the side is a beach bar and restaurant but this was one of the places yet to open for the season when we were there. A town centre that also boasts Blue Flag beaches. 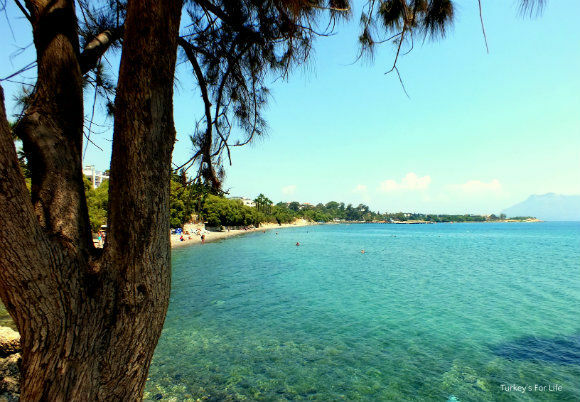 The Datça beaches are a mix of compact sand, shingle and pebble. The sea is supremely clear and often calm, making Datça town a great place to swim. Public beaches are Hastane Altı Plajı (pictured above). ‘Hastane Altı’ means ‘under the hospital.’ Guess the hospital used to be just above here? Sandy Kumluk Plajı is the setting of the beach restaurants mentioned above. This is the compact sand and calm sea that was being enjoyed by the local kids as they came out of school. Round the corner, just beyond Ilıca Lake is Taşlık Plajı. 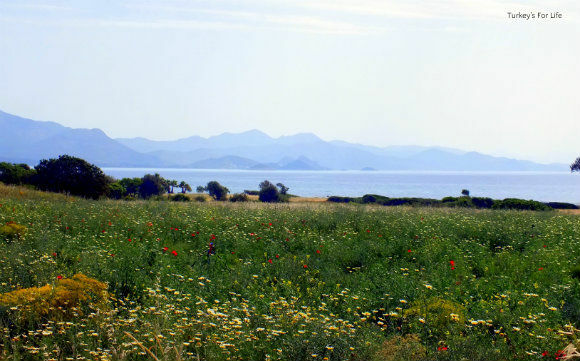 The Datça beaches are no doubt packed in the summer months, but, on a spring morning run, all was quiet and peaceful bar a few early sunbathers and swimmers. Sevgi Yolu – think Lovers’ Lane. This is a beautiful cobbled shoreside walkway that joins onto Kumluk Yolu. The two roads meet at a junction which is where our hotel, the Fora Apart Hotel, was situated so it made our morning stroll and jog so much easier. Sevgi Yolu is where I couldn’t help but take so many photos and it’s perhaps the views from here, along Hastane Altı Plajı, that captured me most while we were in Datça. On the couple of occasions we were along here, there were no cars, no scooters. Just people ambling, enjoying the day. It’s just as well we were only supposed to be doing slow runs! Mine was particularly slow – well wouldn’t you keep stopping to photograph scenery like this? So peaceful and calm in the mornings. Facing the beach and running along the opposite side of Sevgi Yolu is a series of small hotels. People were breakfasting in the gardens and by the pools as we walked by. The platform in the photo above made for a tranquil scene on the first time we passed. The following day, summer preparations were underway and, if you’re staying in the corresponding hotel, you can sunbathe with bed and umbrella at the end of the little jetty. And no doubt take a dip in the sea, too. Ahh, and if you want to wander a little further, we continued along Sevgi Yolu and into a bit of suburban Datça town before coming out at Burgaz. This is where the people of ancient Knidos are said to have lived originally. The ruins are scant – yet to be fully excavated – but the springtime scenery of wildflowers and distant coastline around here is beautiful. We’d seen so many photos of Eski Datça on Instagram over the past couple of years or so that we just couldn’t miss out on a visit to the old town on this trip. We decided to walk it (around 70 mins via side streets rather than the main road) but there’s also a bus that takes you up the hill to the junction. 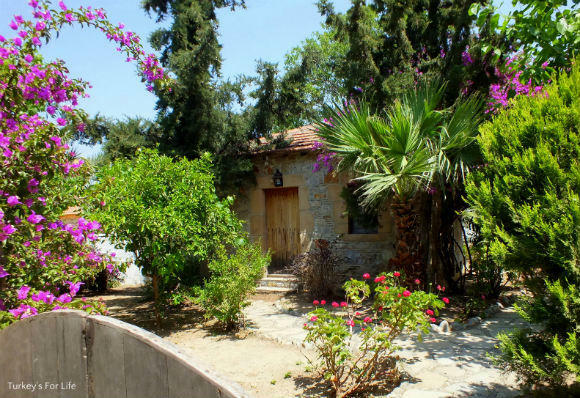 Eski Datça is all about stone houses, narrow alleyways, pretty gardens and bougainvillea-clad walls. Apparently, it was almost abandoned just a few years ago but people are now moving back to the area to have summer houses, small pensions and boutique hotels, bars and restaurants and craft shops. 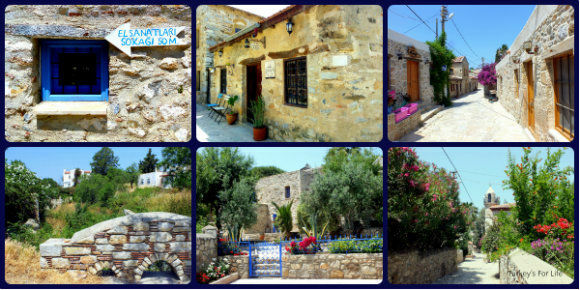 On the route of the Carian Way, this pretty little part of Datça town attracts a whole mix of people. There’s building going on – all in the style of these original older houses – so we couldn’t help but think, as we wandered around here, that Eski Datça is soon going to be a thriving part of town. And that was our experience of Datça town. There are other things to do – you can visit the winery and vineyard, for example. In the past, we’ve visited Yazıköy and picked olives, we’ve explored Knidos and returned to the popular Palamutbükü. If you’re staying around for a while, you can take in other areas of the peninsula quite easily. We intend to in the future. For us, though, on this occasion, it was just about getting to know the main town a little better. And we’re really glad we did! If you’re arriving in Datça by bus, you will change at Marmaris Otogar. There is a regular minibus service from Marmaris to Datça. You can arrive in Datça via ferry from Bodrum, too. We were there early season and a few places were yet to open. Although it is low key, expect more crowds in summer months. As well as boat trips around the bays, in summer, it is also possible to sail to the Greek island of Symi from Datça. You can book accommodation in both the town centre and the quaint old town through Booking.com. Where is it best to fly in. Presumably Bodrum. Suey, you can fly in either Dalaman , or Bodrum airport. 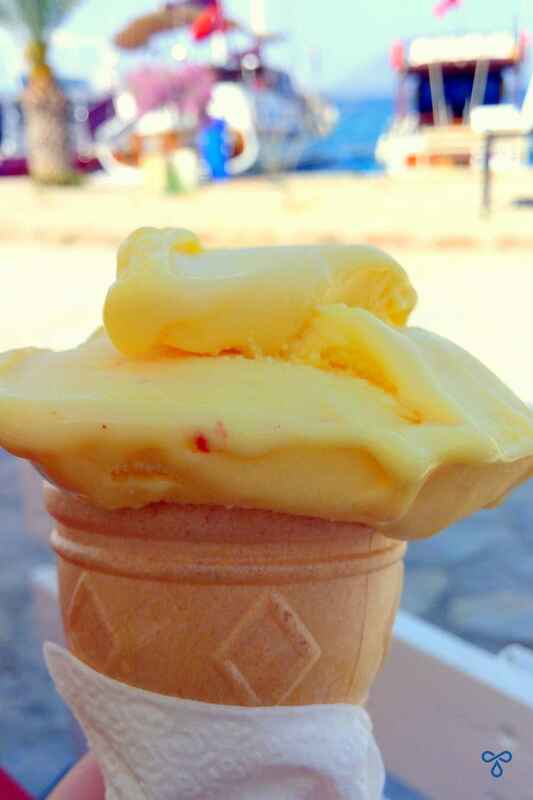 Dalaman is 2.5 hour ride , usually buses available or you can use private Datca transfer mini bus which is 50 Turkish Lira, Bodrum will be harder because ferry-boat to Datca only works between June and September, otherwise Bodrum to Datca is about 4 hours ride. Either way you will not regret visiting Datca .